Ever since French popular singer Jean Ferrat wrote about hormone-fed chicken in 1964, scandals have been steadily discrediting the public image of agri-food industries. The list is endless, from the mad cow crisis to salmonella-infected baby formula, not to mention the bird flu pandemic, adulterated colza oil, as well as horsemeat in so-called beef lasagne, to name just a few of the latest cases… And what about conventional farming poisons, battery breeding, dismal meat slaughtering practices denounced by L214 association and cruel mistreatment of chicks or pigs ? All this abuse has outraged the French. A lot of people have ended up building a sense of having had more than enough. Moreover, the near monopoly position of the mass retail sector, together with its questionable ethics and environmental impact, have discouraged some consumers who are now dreaming of something different. However, how can we reconcile our willingness to eat healthier food, consume local and organic products, have a low environmental impact and promote sustainable farming, with our desire for ethics, transparency, sharing and self-governance ? The answer is to be found in the United States where thousands of food co-ops were created in the 1970s by groups of friends or neighbours. A lot of these pioneer cooperatives did not survive but there are still 350 food coops left in the US which only co-operators may access. Some of these Food Coops have proved very successful. Park Slope Food Coop in Brooklyn, New York, has now become an essential reference : 17,000 members, 70 paid employees, high quality fresh products at a reasonable price, transparent management, uncompromising ethics and all members spending three hours monthly to share the workload. The documentary https://foodcooplefilm.com/, directed by Tom Boothe in Brooklyn, made a large number of people realize that a radical change was within their reach. This is how the director and his film inspired La Louve in Paris, SuperCoop in Bordeaux, La Cagette in Montpellier, Super Quinquin in Lille, Bees in Brussels and, one co-op leading to another, some twenty other co-ops were born. 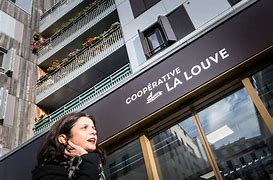 Co-operative supermarkets are also under way in all French regions, for example in Rennes, Lyon, Juvisy sur Orge, Nancy, Toulouse, Toulon, Grasse, Versailles, in the Basque country and Annecy. In the south east of Ile de France, in a rural and semi-urban area, a project called Cooplicot is in the pipeline. Cooplicot’s earliest meetings started in June 2017 with five people, also involved in a LETS. The group increased to a hundred people in four months. Commissions were created to think about all the aspects of the project : ethics, member recruitment, provider sourcing, locations, services, rules, communication, website and facebook page etc. Ideas and conviviality are actually not enough to achieve a collaborative entreprise, the projet must be fine-tuned to the tiniest detail. After a two-year experiment period, the foodcoop will finally be officially founded at the end of January 2019. Coops are driven by a willingness to change things. A turning point has been reached with the threat of global warming, the excesses of conventional farming and job insecurity. Citizens can now find some alternatives to the prevailing economic model : LETS and food co-ops are two of them. Do you have any other suggestions or experiences to share with our network? We suggest you share them with us via [email protected] and we will pass them on as far as we can.